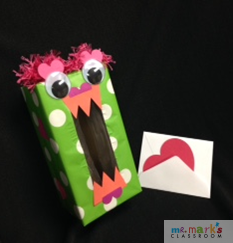 Look at your tissue box and its opening and decide how you want your monster to look. Wrap the box in colorful wrapping paper, leaving the hole open. Decorate the box with googly eyes, ribbon, construction paper, etc. to make your monster. Valentines can be inserted into the monster’s mouth.